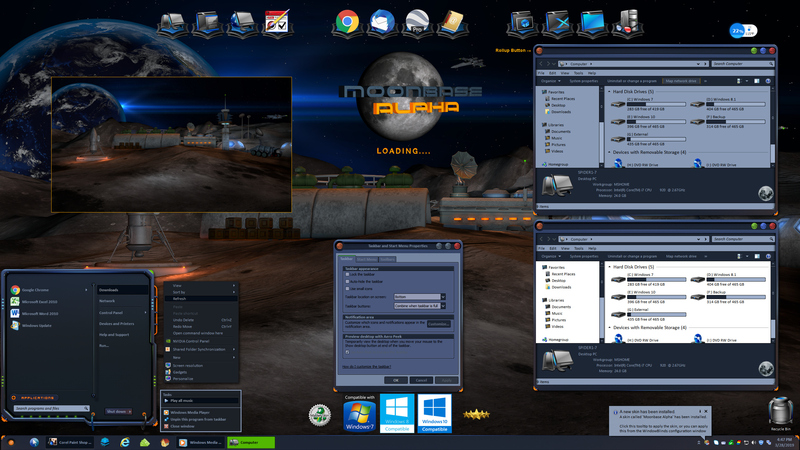 Moonbase Alpha is my latest Master Skin for Windows 7, 8 and 10 with dark and light explorer sub-styles. It is easy on the eyes, yet has great looks and functionality. A roll-up button has been integrated into the skin for those who use it, and many thanks again to RedneckDude for his valued assistance in the testing of this skin. The wallpaper shown is included with your purchase in 1920x1080 and 2560x1440 resolutions. I am sure you'll enjoy the look of Moonbase Alpha on your desktop! Jakeco, it has a rollup button. Top left corner. Tom, you never cease to amaze me... you have such an outstanding talent. This is a keeper and that's for sure! Jakeco, it has a rollup button. Top left corner. Great skin, Tom!! Now this is really awesome! Haven't used it yet. I gotta save all I can for a trip in May but once I get back from vacation, I will be buying this one! It's just so awesome looking!!!! I got a space suit.